"This First in a New Series Is Strong Enough to Stand Outside the Confines of Its Genre"
First in the new Food Lover's Village Mystery series, DEATH AL DENTE focuses on main character Erin Murphy who has moved back to her hometown to help her mother manage and update her family's legacy, the store that has been known as Murphy's Mercantile almost since the town of Jewel Bay, Montana was founded. Drawing on the area's small scale local agricultural and food production, Erin has turned Murphy's Merc into a welcoming place that features delicious locally grown food and locally made culinary goods. 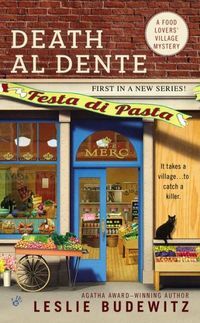 To kick off the store's new focus and feature the town's many gourmet restaurants, Erin and the rest of the town are in the midst of putting on a Festa Di Pasta when a murder of a close friend of Erin's mother puts a tragic spin on the event. This is Budewitz's first novel-length mystery, and it's a good one. She has avoided the pitfalls of contrived plots, pushy amateur detectives and shallow connection to the deceased that plague a number of long-running cozy mystery series and has produced a book even a non-mystery reader will find engrossing and satisfying. As a reader, you will come to care deeply about Erin and her family as well as the cast of characters, each with their own backstory and niche they fill in the small town of Jewel Bay, Montana. Leslie Budewitz also deftly handles the expressions of grief the murder victim evokes from her friends and acquaintances, helping you become even more enmeshed in Erin's desire to find the killer. Although romance and dating plays a certain role in Erin's life, her core relationship outside her family is one with the town's sheriff's detective, Kim Caldwell, an estranged friend who was as close as a sister when they were children. This is a hallmark of the maturity and care with which DEATH AL DENTE is crafted. It is not simply a formulaic cozy mystery, it is a novel strong enough to stand beyond the confines of its genre. I highly recommend it. Oh, and the recipes included at the back of the book look mouthwateringly delicious and simple to prepare, too. Leslie Budewitz has published a non-fiction reference book called Books, Crooks and Counselors: How to Write Accurately about Criminal Law and Courtroom Procedure as well as several short mystery stories and is currently working on the first book in another cozy mystery series, the Seattle Spice Shop series. The town of Jewel Bay, Montana—known as a Food Lovers' Village—is obsessed with homegrown and homemade Montana fare. So when Erin Murphy takes over her family's century–old general store, she turns it into a boutique market filled with local delicacies. But Erin's freshly booming business might go rotten when a former employee turns up dead? But Erin's sweet success is soured when the shop's former manager, Claudette, is found dead behind the Merc on the Festa's opening night. With rival chef James Angelo stirring up rumors that Fresca's sauce recipes were stolen from Claudette, Erin's mother is under close scrutiny. Now Erin will have to hunt down some new suspects, or both her family and her store might wind up in hot water? "Who put these huckleberry chocolates on the front counter?" I grabbed the stack of purple boxes crammed with gooey huckleberry–filled chocolate wannabes swathed in purple foil and shoved them onto an open shelf on the side wall, next to the herbal snoose. "I did, honey," my mother said. "Our customers love them." "Our customers," I said, "buy one for seventy–five cents and walk around the store, so preoccupied with unwrapping it and indulging their sweet tooth that they can't fathom buying Montana–made goat cheese, or buffalo jerky, or your pastas and sauces. Then they grab a napkin that costs us five cents apiece to wipe purple goo off their fingers, and half of them drop it on the floor. There goes our profit." My mother scowled. "Erin, what on earth has gotten into you? Why do you hate huckleberry chocolates?" "I don't hate huckleberry chocolates. I love huckleberry chocolates. But we can't rebuild this business on fake food and chemical sugar." She picked up the boxes I'd just moved and carried them back to the cash register. "We have always had huckleberry chocolates right here, where the customers can see them." "Mom, you hired me to run the place, remember? To shake things up." "Some things shouldn't be changed." "Mom, we agreed. The Merc will die if it's just another knickknacky gift shop. But an artisan market for local and regional foods—"
"Those are local. They're made five miles from here, by a woman you've known half your life." "With high–fructose corn syrup and milk chocolate that tastes like rancid Hershey's. If we find a vendor using fresh berries, real sugar, and high–quality fair trade dark chocolate, sixty percent cocoa solids or better, I will build the Great Pyramid of huckleberry chocolates right here." I jabbed at a spot on the oak floor, ten feet inside the Merc's front door, little changed in the hundred years since my grandfather Murphy built the place and opened the town's first grocery. "I will worship at her kitchen stove. I will put an ad in the paper and a post on Facebook offering a free huckleberry truffle to everyone who walks in that door. And if they aren't wrapped in purple paper, I will even consider raising the price split." My mother stared as though she didn't recognize me. Not for the first time since I'd returned to Jewel Bay, Montana, the hometown I couldn't wait to leave after high school, fourteen years ago, to take over her struggling business so she could focus on building her own product line. And not, I was sure, the last. "But Erin, chocolate isn't local. Neither is sugar." Tracy, my shop clerk and sole employee, cocked her head, her thick chestnut hair swaying. One elaborately beaded earring brushed her plump shoulder. "That's not the point." I reshelved the chocolates. Poor things. Not their fault they represented the worst of the specialty food market. Overprocessed and overpriced, they were nothing more than overhyped M&Ms that melted in your hand, and gummed up your mouth. "Our mission is to sell high–quality natural and organic food. Real food. Sustainably grown." We'd been over this, and my mother had agreed, knowing the Merc desperately needed a change in direction to survive. But while she'd turned over the reins, she hadn't quite given up control. "We showcase the local, but we won't sacrifice quality for proximity. We are selling a vision—the natural taste of Montana." "If it's made in Montana, it must be good." Tracy repeated our new slogan in a singsong voice, her earrings swaying like a drunk failing a field sobriety test. She squeezed her Diet Coke can. Its metallic twang made my brain hurt. "I think you're taking this Festa too seriously," my mother said. Like you always do, I heard in her tone. "Why don't you eat something? Slice up some tomatoes and fresh mozzarella, with basil and that yummy herbed olive oil." I groaned inwardly. The two women who ran Rainbow Lake Garden had brought us incredible Early Girl tomatoes and heavenly Genovese basil from their greenhouse. Perfect for Caprese salad, the dish the angels serve when God needs a snack. "Mom, thanks. You go ahead and eat, but I've got too much to do. We still have to decorate." The Merc, formally known as the Glacier Mercantile, backed on to a small courtyard. Our next–door neighbor, Red's Bar, sported a larger courtyard. Tonight, we were throwing open the gate between the two and hosting the kickoff dinner for the First Annual Jewel Bay Festa di Pasta. Tracy and I had decorated our space that morning. But Old Ned Redaway—aka Red—didn't want us to "doll the place up" until his Friday burgers–and–beer lunch crowd had cleared the door. Which meant ignoring my gurgling tummy until every table was set and the last lights strung. Meanwhile, we had a store to spiff up. For the next hour, we filled shelves and displays with goods our vendors and producers had delivered, and worked with the smattering of midday customers. I helped my mother—Francesca, aka Fresca—refill the coolers and shelves that held our signature products and biggest sellers: her handmade pastas, both fresh and dried, and a dozen varieties of sauce and pesto. That done, she restocked wine from Monte Verde Vineyard: Chardonnay, a red blend, and cherry wine with the peppery vibrance of a young pinot noir. She cradled a bottle of prize–winning Viognier, admiring the label my sister had designed. I paused to read over my mother's shoulder. "Looks great, doesn't it? Chiara turned Jennifer's scribbles into a brand with a simple, attractive message." "Yes," she said. "It says �drink me.'" I laughed and kissed her cheek. Working with—for—my mother wasn't always easy, but we were still the Murphy girls. On the surface, the Merc looked like any other specialty food shop. In reality, we were more like a co–op, with nearly two dozen regional growers and producers consigning their food and drink for sale in a single space. I wanted to prove that even a small mountain town with long winters and a short growing season could do a lot to feed itself, while sharing local bounty with our thousands of summer visitors. In the two months since I'd been back in town, we'd redefined our goals and realigned our product mix. The Festa—a village–wide event I'd conceived to celebrate the start of summer—was the big test. After all, we called ourselves The Food Lovers' Village. I helped Tracy unpack cartons of jams and jellies, lining them up on the shelves and in the open drawers of an antique Hoosier cabinet: cherry, strawberry, black cap, wild chokecherry. And the cr�me de la cr�me, the King, the Queen, the Champion of jams, wild Montana huckleberry.